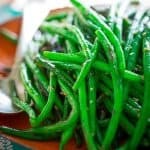 These simple skillet green beans are a perfect healthy side dish. They are made in one pot with garlic, olive oil and a little spice. They are vegan, paleo and naturally gluten-free. Heat oil in a large skillet over medium-high heat. Add red pepper flake and stir to coat the pepper in the oil. Add green beans and cook, stirring often until the beans are blistering and browning in areas, 5 to 7 minutes. Add garlic and salt and cook, stirring constantly until the garlic is fragrant and browning, about 30 seconds. Add water and immediately cover. Cook covered until the beans are bright green and crisp tender, 1 to 2 minutes. Serve immediately.